The backlog of food posts is getting longer and longer but I buy my internet time by the minute here so you will have to hold tight for another day or so until I manage to get back to my desk and start churning out posts. So much to write about, so little time! egads pesticides! *sigh* id rather imperfect pesticide free produce rather than perfect ones any day although organic produce can be a tad bit pricey. will be waiting for the new MM posts :) will there be a post on coffee since you’re in benguet? Oh no! Never eat strawberries without washing them! I read an article sometime ago about a child getting major sick due to eating unwashed strawberries. Hope you did not eat a whole bunch. That’s a bummer! But I don’t know what could be worse- seeing them spray insecticide or seeing them spray organic, albeit improperly composted chicken manure, which was the cause of at least 1 salmonella outbreak from strawberries in the US a few years back (and improperly washed as well, apparently). I’ve been wondering about the Baguio strawberries lately.. i buy them here in Laguna, happy to get them firm and relatively unbruised in the styro and cling wrap packaging they come in. I stick them in the refrigerator, forget about them for a few days.. and when i open the pack, they’re still the same! Then it dawned on me – could they be giving it a formalin bath?? Traders have been known to do this with vegetables, tomatoes especially. If your tomato doesnt ripen and subsequently rot in a few days of sitting on your counter, then it surely has been given a special bath. What do you expect? We live in a country with one of the most complete bug collections on earth!!!! Pesticides or bug ridden fruits for us….. It is great to go organic until you realize the interesting fertilizer that goes into the soil. Unless our farmers grow crops in completely enclosed greenhouses it will be difficult to get completely bug free fruits and vegetables. There are just some plants that are totally susceptible to insects. Tried growing tomatoes and okra in the garden before. Tomatoes were almost immediately infested with borers. Read about a remedy of using nylon stockings to protect them. Believe it or not they went through the nylon. I was successful with okra. Certainly enjoyed fresh sweet harvested compared to old, stringy supermarket type. Sometimes we may be better off not knowing what happens to our food supply. When I did the eat all you can pick strawberries in Pennsylvania, there were deer grazing nearby and even droppings in the strawberry patch, so I was quite sure they were safe to eat. Or maybe, whatever resides were not enough to kill deer, lol…. Freshly picked strawberries are indeed super sweeeet! I’m planning on growing my own strawberry patch after I ate some from a friend’s strawberry patch and found out they tasted so sweet, there was no need to add sugar. I guess strawberries are at their sweetest when eaten straight from the plant. Talking about pesticides, I recently stumbled on a blog stating what the most pesticide laden produce are. I tried ‘googling’ again and found this link, http://www.foodnews.org/EWG-shoppers-guide-download-final.pdf , wherein it lists the top 12 fruits and vegetables that you would better off buy organic. Hope this helps on your food buying preference. I noticed that you’re wearing your watch on your right wrist. Are you by chance, left-handed? 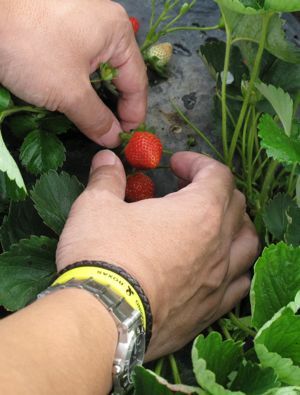 Wish I could go strawberry picking in La Trinidad too… Manila has been terribly hot lately. How come fresh strawberries smell and taste like guava? I seldom had that pleasure of eating ripe strawberries that smell and taste like strawberry preserves or jam. MM, you’re not supposed to ever, ever eat benguet strawberries right after picking. aside from the pesticides, you’re not sure about the water they use. one time i saw a woman repeatedly dip a bucket into a nearby ditch, and splashed the water all over the plants. i was frequently in la trinidad when i was growing up and i am friends with a lot of actual farmers/gardeners. they tell me that those poisonous pesticides/fungicides/herbicides definitely increase their income that is why they have no second thought spraying those things on most of their produce. however, they themselves are aware of the dangers of this chemicals and they don’t eat the vegetables/fruits they spray. they always have some small plots planted with the vegetables/fruits that are not sprayed but are reserved for their private consumption. the trick is to ask the vendors/farmers/gardeners about these products that they themselves eat (may look uglier but definitely healthier). that has been my strategy whey I but vegetables and found them all to willing to share these to anyone who ask. if you’re still in baguio, i wish you could visit the garden that supplies organic veggies to Baguio’s top hotels and restaurants. their set meal is delicious. i can’t remember the name now, but the place is in la trinidad, near the tam-awan artists’ village. When I was in Baguio about a year ago, I thought the strawberries were horrible! It was March/April, so they weren’t in season (I guess), but after eating perfectly ripened strawberries from Japan, it was hard to eat a strawberry that tasted like cardboard. I feel the same way about strawberries in the US and Canada now. I think I might have to grow my own! BTW, there’s a restaurant in La Trinidad called Eve’s Garden. They grow all their own vegetables organically, and the owner even took us on a tour of it. It’s a beautiful location, though a bit difficult to get to without a car of your own (the taxi charged us an arm and a leg to get out there!). Other than the salads which are amazingly beautiful, the rest of the food is just OK, but I think it’s still a worthwhile visit. Reservation only, and sometimes they close just because they feel like it! “Let me take you down ’cause I’m going to Strawberry Fields, nothing is real and nothing to get hung about. Strawberry Fields forever.” What the Beatles might have meant by “nothing is real” is that nothing is “real” or organic. “Nothing to get hung about” would mean you won’t get stoned by eating, sniffing, injecting strawberries. “Strawberry Fields forever” would then mean that the fields will still be there with pesticide mutated strawberries when the pesticide affected human race goes extinct. It does not end there, the Beatles, due to the effect of whatever hallucinogen they were on, had foreseen Marketman’s experience hence the song continues with… “Living is easy with eyes closed, misunderstanding all you see.” Had Marketman’s eyes been not open he would not have seen the fields sprayed with pesticides..
hello. i’m using an ozonizer on the water which i soaked my fruits and vegetables in to get rid of pesticides and dirt. Lee, haha, you must have been typing that as I was typing my last comment. A bit of a “stretch” if I may say so myself. But yes, funny how a song and its name can be so memorable. Jake – – I came across that handy list a while ago and have been using it to determine whether to buy organic or not. It’s unfortunate that cherries, peaches, strawberries and bell peppers come under the “high pesticide” category. i like your xxxxxx watch (sorry tiger, I deleted the brand name… didn’t think that was discernable… thanks, MM). Before there was a Silicon Valley, there were orchards and fields. The Santa Clara Valley was know as the Valley of the Heart’s Delights. Back in the day, there was one farmer who didn’t sell his land. Next door to them is a company that specializes in designs and production. At any rate, the farmer would grow everything from strawberries to flowers. The farmer even opened a roadside stand. Reading in the paper, the company wanted to buy some land. The farmer refused. The kicker was that the strawberries he was growing were well known for size and quality. It turned out that they thrived on the heated air from the company’s buildings. The best part was reading that his return customers were employees from that company. I am in Baguio too MM. But I haven’t gone to Strawberry farm just yet. Enjoying the weather here! Enjoy your vacation MM! It’s always good to know what are the most pesticide laden fruits and vegetables. There are people whose bodies have trouble detoxifying their bodies naturally so it’s best for them to take caution and buy organic with regards to these foods. Infants and young children, who have bodies and brains that are still developing should, in fact, not be given these foods and be given the organic ones instead. Ditto with people who have asthma and those that are susceptible to allergies. Hope this helps. this is the type of strawberry plant that i have in my garden. enough for our cereal and for shake…. your candidate of choice(pres. & senate) & how you will associate them with food or any local produce… i think itl be a VERRRRRYYY funny post. Wait, did you tell us where you were in that post that asked where we thought you were? Or did I miss it? wow strawberry farm at La Trinidad! we were there last Sunday! if you pick your own strawberries they will charge you 180-250 pesos per kilo but if you buy the pre-picked ones 90 pesos per kilo which you can pick from a big basket. :) did you try picking the broccoli by yourself too? Broccoli picking is free and they will charge you 100 pesos per kilo. Weather in Baguio was not that cold when we were there. I could not resist showing this post to my husband. You see, hubby has taken to growing our own strawberries in our back garden. We don’t have a dedicated area for it or anything but for the past 3 years now, the same plant has been thriving each summer and my husband covers it pa with netting and all that to prevent the birds from devouring them. They’re not plenty but they are the sweetest, pesticide-free! strawberries you’ll ever eat! hello, marketman. thank you for your blogs about coron, palawan. does coron village lodge has a landline number or cellphone or emaill address ?. my family and i are planning to visit the place . 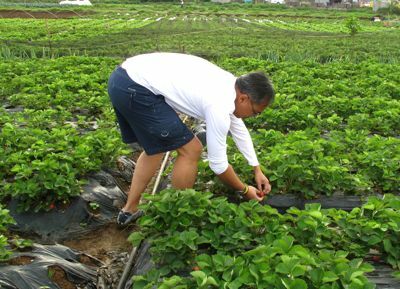 edee, how cool to be growing your own berries… many decades ago, we tried to grow strawberries in Quezon City, in our front yard, but I don’t think they bore many fruit… Ingrid, didn’t stop at Villasis, but we did get to the vegetable trading post in Benguet. vicki2, no net yet… BACKLOG of posts! :) sgboy, hahaha, not likely, imagine if I associated one candidate with a vegetable that they didn’t think appropriate? I got enough flack for describing pork as fatty, what more if I say a candidate strikes me as a genetically modified carrot? Hahaha. How was the Trading Post, MM? Or will it be a future blog post? Strawberries are my absolute favorite! A very versatile fruit indeed, you can have it for dessert or toss it in a savory salad. Thanks Market man for letting me know about La Trinidad! It’s a definite must-go for me! One of my favorite food-related experiences was sleeping in a ground floor bedroom with sliding doors that opened out within a meter or two from the family’s strawberry patch. This was in Japan and when I found out what were outside the door, I couldn’t wait for morning to come. We picked some the next day with a bowl of water on the ready for swirling the strawberries about before popping them into our mouths. Interestingly, a friend of the family I stayed with was growing tilapia. They were more interested in the fish than in the berries. No strawberry pies for me, though they’re probably delish. It’s more than enough to cool them in the fridge, then dip them in hot, dark chocolate. Add whipped cream or ice cream and almond slivers, and I do believe this could qualify for my last supper, if ever I’m lucky enough to have the luxury of enjoying one before I go.